BC Parks is currently undertaking a fuel reduction project within and around the Surveyors Campground area of Kikomun Creek Park. This project will help reduce forest fuel loading and further protect Kikomun Creek Park�s recreational values from potential wildfire. Please use caution, stay clear of equipment and crews, and obey posted signs and closures. Located in a dry and sunny area of the province, this park preserves an example of Interior Douglas fir and Ponderosa pine forest and grassland habitat. Paved roads within this family oriented park are conducive to biking. Ponderosa campground offers 10 vehicle accessible campsites with electrical hook-ups. The charge is an extra $5/night. Electrical hook-up sites have been extended in size and now have fire rings available. Fishing for Kokanee in the reservoir has been excellent, although the fish are small. Cabins are available for rent in the park at the Ponderosa Campground and near the Ponderosa Group Site. Visitors are asked to only enjoy viewing the painted turtles. Because the survival rate of these turtles is low, it is crucial that they be protected in the park and treated with respect by visitors. It is an offence to disturb, abuse, or remove turtles from the park. All campsite, group site and cabin reservations must be made through Discover Camping. When reservations are not available all campsites function as first-come, first-served. Group campsite reservations are accepted for two group campsites through Discover Camping. Picnic/day-use area is available on a first-come, first-served basis only and is not reservable at this park. Cabin reservations are accepted for two cabins through Discover Camping. From the east, turn off Hwy 3, 3 km west of Hwy 3/93 junction at Elko, the park entrance is 8 km west. From the west, turn off Hwy 3 at Jaffray, the park is located 16 km south. History: Created on May 18, 1972, the park is located on Lake Koocanusa, a 144 km long reservoir created by the Libby Dam on the Kootenay River in Montana. Conservation: Because native grasslands are rare to this part of the country many endangered plants are found throughout the park. An extensive program to restore native grassland is underway in the park. Flowers, trees and shrubs are part of the park’s natural heritage, please do not damage or remove them. The management plan for Kikomun Park was approved in March 2014. Canoeing is welcome on Surveyors Lake within Kikomun Creek Park. There are kayaks, stand-up paddle boards, and peddle boat rentals available at this park. Bicycles must keep to roadway and designated bike trails. Bicycle helmets are mandatory in British Columbia. 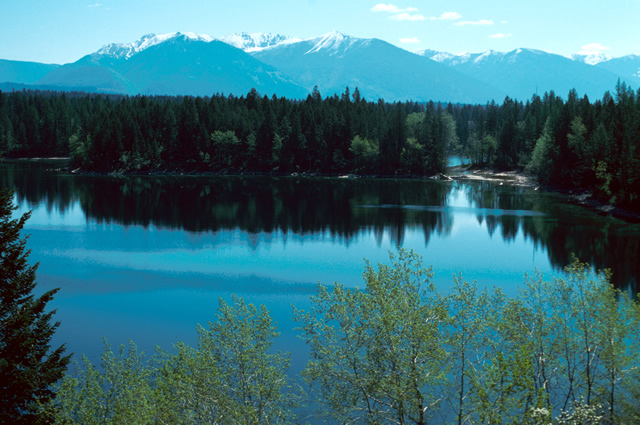 Smallmouth bass and rainbow trout can be found in Surveyors Lake and kokanee in Lake Koocanusa. Anyone fishing or angling in British Columbia must have an appropriate licence. Hunting is allowed in Kikomun Creek Provincial Park during a lawful game hunting season. Please check the Hunting and Trapping Regulations Synopsis for specific details. Hunters are reminded that, it is prohibited to hunt or discharge a firearm or bow in a BC Park within 400m of either side of the center line of any park road. There are no lifeguards on duty at provincial parks. Surveyors Lake offers warm water and sandy beaches. A concrete slab boat launch is located on Lake Koocanusa. The drop off can be steep during low water periods. A new public boat launch has recently been constructed near the park on Lake Koocanusa. The park boat launch will now be closed during the off season of the park. P1 – Cabin is furnished with a double bed with single bunk, and single bunk beds sleeping a total of 5 persons. Power outlets within and without, indoor and outdoor picnic table. Campers are required to bring their own bedding and cooking apparatus. Please note there is no firepit at this location. Keys must be picked up from the gatehouse before 8:00 pm. P6 – Larger cabin is furnished with two bunk beds with double beds on the bottom, singles on top sleeping a total of 6 persons. Power outlets within and without, indoor and outdoor picnic table. Campers are required to bring their own bedding and cooking apparatus. Please note there is no firepit at this location. Keys must be picked up from the gatehouse before 8:00 pm. The cabins are open from May 8 to September 30. While campfires are allowed and campfire rings are provided at each campsite, we encourage visitors to conserve wood and protect the environment by minimizing the use of fire and using campstoves instead. Firewood can be purchased in the park or you may bring your own wood. Fees for firewood are set locally and may vary from park to park. Limited burning hours or campfire bans may be implemented. To preserve vegetation and ground cover, please don’t gather firewood from the area around your campsite or elsewhere in the park (this is a ticketable offence under the Park Act). Dead wood is an important habitat element for many plants and animals and it adds organic matter to the soil. Please note: for sites with electrical hookups, there are no firepits. Ponderosa campsite offers 10 vehicle accessible campsites with electrical hook-ups. The charge is an extra $5/night. Electrical hook-up sites have been extended in size and now include fire rings. There are two group campsites at this park. The group campsites are open from May 19 to September 30. Click here for reservation information. There is an adventure playground located between the day-use area and Surveyors Lake campground with a grass area adjacent. There are hot showers at the Surveyors Lake Campground, Ponderosa Campground\Group use area and at the South Pool group use area in this park. This park offers vehicle accessible campsites. Campsite reservations are accepted and first-come, first-served sites are also available. Ponderosa campsite offers 10 vehicle accessible campsites with electrical hook-ups. Electrical hook-up sites have been extended in size and now include fire rings. BC Senior’s Rate (day after Labour Day to June 14 only): $17.50 per senior party/night plus, if applicable, $5.00 electrical/night = $22.50/party/night. Read the User Fees Policy for information on Senior Camping Discounts.